the greatest christmas movie of all time. I know there are a lot of good Christmas movies out there..National Lampoon’s, Elf, A Charlie Brown Christmas, even the old timey It’s a Wonderful Life…but the greatest Christmas movie of all time, is without a doubt, A Christmas Story. You may not believe me, and if that’s the case, then I don’t believe you not believing me. In order to prove its greatness, I’ve compiled the following (abridged) list to detail exactly what sets A Christmas Story apart from all of those other Christmas bits..
1. The Narrator- All the best movies have narrators, (Shawshank, Forrest Gump, Goodfellas, Ferris Bueller’s Day Off, Fight Club)…and Ralphie is the best narrator of them all. 2. The Ridiculous Sibling- Randy is the greatest movie sibling ever…and he says stuff like “Meatloaf, smeatloaf, double-beatloaf. I hate meatloaf.” ..what? 3. The Major Award – Honestly, everything about the leglamp is awesome…Ralphie’s Dad can’t get enough of it, his mom detests it, and I think Ralphie has a crush on it. 5. The Outlaw – Anytime you can mix a cowboy into a movie, it’s a good idea…plus, Black Bart was a real gunslinger..who knew? 6. The Christmas Presents – Oh, like you never got anything ridiculous for Christmas. 7. The End – That’s right, the end of the movie is good too. Most movies have trouble with the end, but this one is spot on. I think that about covers it. If you don’t like this movie, you have no one to blame but yourself. My brother and I were just talking about the greatness of A Christmas Story yesterday. He found some leg-lamp Christmas lights and is thinking he needs to get them for his house. Very classy. There are so many great moments in this movie. Yeah, this too is my favorite Christmas movie….narrowly beating out National Lampoon’s Christmas Vacation 2: Cousin Eddie’s Island Adventure. A timeless classic. I?d have to go with a tie between A Christmas Story and The Grinch (it?s a classic!). That being said, I have to narrowly give best narrator ever to Peter Falk in The Princess Bride and at least an honorary mention to David M. Evans in The Sandlot. So I assume you?ll be watching the A Christmas Story 24 hour marathon? I double-dog-dare ya. kate- I most certainly will.. Your right on the movie, That could have been me. My generation. Looks like I will see you in Jan. Luck of the draw. One must agree that this is hands down the best Christmas movie! Great choice of a picture…it looks like my son everytime we bring him outside! Any Christmas traditions you are looking forward to? Greatest holiday movie ever? Fudge yeah. Kevi,n without a doubt – the greatest Christmas movie! And the Red Rider BB gun? We own one in my home! (Will have to agree with Kate – I think Peter Falk is the greatest narrator in a movie.) My boys can quote large portions of the movie. It isn’t the Christmas until we watch it. I hope you and your family have a wonderful Christmas & a Peaceful New Year! Sorry, Kevin, I have to go with It’s A Wonderful Life. 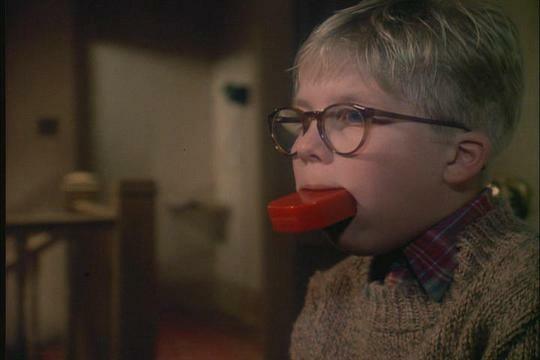 Perhaps because it’s shown only a couple of times per season, rather than the 24 hr marathon A Christmas Story gets. BTW, Bob Clark, the director of little Ralphie’s tale, also directed Porky’s. Why no mention of Yule Log? It has a 24 hr showing. I just love it when the hands come into the picture to add on another log. I’d like someone to update it by adding in the hands roasting marshmallows. kgonz- the yule log? thats only good if you are hosting a holiday party and don’t have a cd player.. or a fire. an expertly argued hypothesis. well done. hopefully this can put an end to the claiming of “It’s A Wonderful Life” and “The Santa Clause” as the best christmas movies. Hard to argue with any movie that accurately predicts an eye being shot out! Have a Merry Christmas and thanks for giving us diehards something baseball related to get us through the frigid winter! I could not agree with you more!!! That is THE best Christmas movie. They sayings they have about kids and Christmas are spot on. Not to mention it seems to be every little boy’s dream to own a bb gun. Have a great Christmas, Kevin! Merry Christmas! I have to agree that Christmas Story tops them all! I laugh so hard, I cry! Have a wonderful Christmas and Happy New Year! My friends and I were at Twins Fest 08 and I was impressed by your candor and quick whitted responses during the Q&A time with the little kids. I am guessing you would’ve gone into teaching had you not made it into the major leagues! What was your college career path? PS: Sorry you couldn’t take us up on the Champs invite. Merry Christmas and Blessings for a great New Year. lam23- i was majoring in business ( management and marketing) with a minor in spanish…and i think i would have liked to get involved in international business somehow.. I guess I will have to check out Christmas Story. I have not seen it. I guess teaching 6, 7, & 8-year olds for 37 years, my Christmas programs leaned more toward Charlie Brown and The Grinch (the old cartoon version). I had to keep up on what my students were watching (or at least try). You’ll shoot your eye out!! You’ll shoot your eye out!! Huge fan here, watched you all the way from single A. Stay healthy, I am predicting at least one, possibly 2 or 3 no hitters in your career. Hope the Twins can keep you!!! I particularly like Ralphie’s essay on why a football doesn’t make a good Christmas present. On the other hand, a baseball (and a glove) would have given Red Rider a run for his money. Imagine Ralphie and The Old Man tossing the white spheroid around the backyard (and striking out Black Bart in the process). Darren McGavin doesn’t get nearly the credit he deserves for this role. Shrewd Christmas Tree Trader, Major Prize Winner, Furnace Fighter Extraordinaire, Lightning-Fast Tire Changer, Bane of the Bumpus Hounds, Stern Disciplinarian and Little Boy in a Man’s Body — he is all that, and more. He is the ultimate father figure, for both good and bad. Love it!! Did you know that the head elf Ming-Ming in ELF is Ralphie??!! I couldn’t believe it when I found out. My sister has a pink hoodie, complete with floppy ears that says “the pink nightmare” on it. It’s great. Merry Christmas!!! Do you ever get in touch with that Hall a Fame coaching staff from the 2004 Sanford Mainers? haha.. shawdog..ive kept in touch with those guys sporadically over the last couple of years…they were a tremendous staff and instilled a real love for the florida gators in all the player’s hearts..two bits, four bits.. I liked the movie..but I kinda thought Randy was annoying in a way..he reminds me of my brother…ahaha! Sorry I couldn’t keep up with the blog through the holidays. But you did make me laugh out loud with a couple of your entries. And I seriously could not agree with you more that A Christmas Story is THE BEST christmas movie out there. Holiday tradition to watch it as much as possible when the holidays start coming around. And Randy is my favorite character in the movie. Have a good one. The Christmas Story was a good movie, but how can you compare this with the all time cartoon classic, The Grinch. Just catching up on blogs and all that good stuff! This one was hilarious. Ok, that leg lamp is the strangest thing. I have a friend who the first thing you see when you walk into that house is that same lamp. It’s huge and the focal point of his house the moment you step in! I know plenty of people who are inlove with this movie..and I think I have seen it enough times to know it word for word. As for the presents..I kind of thought that bunny outfit was amazing. I for one..would have rocked those bunny jammies proudly! This reminds me of my thesis on why “Better Off Dead” is one of the best comedies of all time, except mine simply read: “Claymation Hamburgers Singing Van Halen – what else do you need to know?” Anyway, well argued.